Violence, money and hunger for power, that’s what Grand Theft Auto: Vice City is all about. Gamers need no introduction as most of them are well-versed with the GTA series and its ‘violent’ missions. This time the scene is set on Vice City! Based on the iconic Miami in the 80’s, it has the perfect setting of gorgeous beaches, women, fast cars, drug lords and crime. The missions are varied, the rules are the same. Welcome to Vice City, where tourism and crime are its key trades. Players, as Tommy Vercelli, have to accomplish missions to get back in the wily world of crime by acquiring money lost in a drug deal. For this, Tommy will do anything, from eliminating informants to engaging himself in a boat racing duel. The interesting part of Grand Theft Auto: Vice City is its varied missions in an open ended environment. Players can explore every part of the city and play the missions in different ways and methods. There are missions where one has to chase a pizza delivery boy and eliminate him, or knock down an informer or just threaten to kill by smashing down vehicles. One mission allows players to engage in a strong-arm duel while another has an adrenaline pumping boat racing mission and dirt track racing mission. Mind you, these missions are quite violent. Kids, stay away! One cannot imagine a complete action-packed GTA game without the inclusion of vehicles and car chases. Yes, GTA: Vice City has some superb four-wheelers and bikes in store for gamers. All resemble the 80’s style. The inclusion of motorcycles makes Vice City a bit different from its predecessors. Players can steal bikes and ride them with complete freedom. 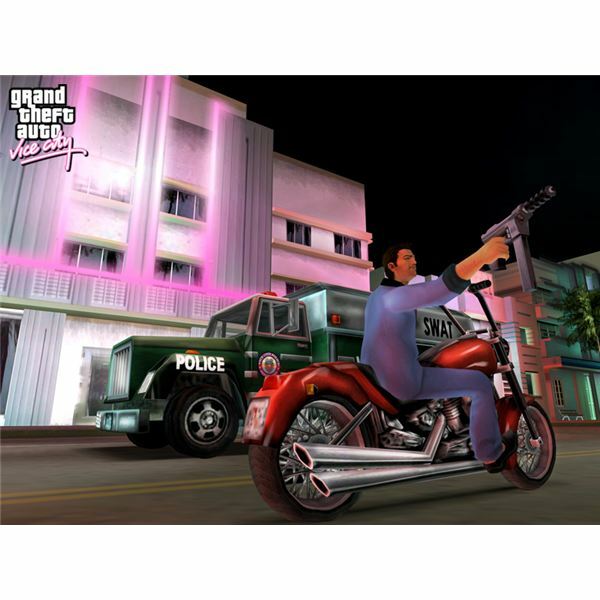 Although motorbikes give you the desired speed to chase targets, still, controlling a bike is difficult in Vice City and may result in collisions. Gamers can also access a RC helicopter, seaplane and boats for air and sea travel. The beauty of exploring the city via air and sea can be exhilarating as these vehicles can be a great for escaping some uncontrollable scenarios. GTA: Vice City lets you damage vehicles by shooting windshields or sniping drivers. Better stay away from the cops as they can choose any method to arrest you, if noticed. One can also purchase properties and generate revenue. But it is necessary to have enough money to buy them and this can be possible by completing main missions. There are some typical GTA mini-missions including rampage, which lets Tommy to kill as many gang-members in a particular time limit. There are taxi missions where players need to drive passengers to their destinations (just like Crazy Taxi) and ambulance missions that allow players to save people by taking them to a local hospital. 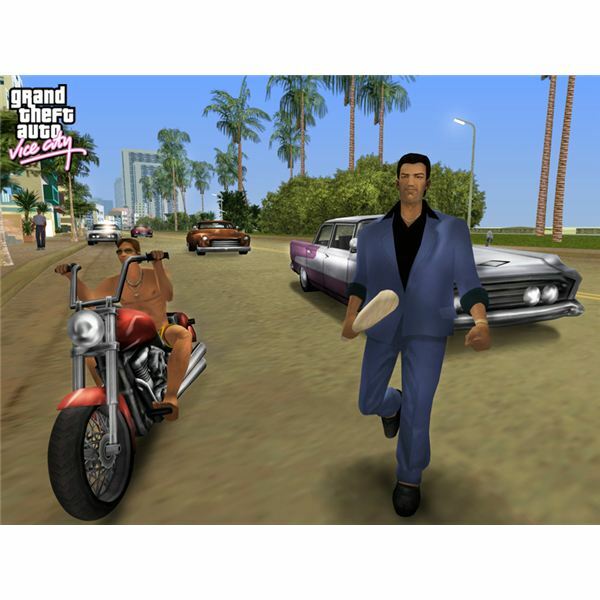 In all, GTA: Vice City has a variety of gameplay. Rockstar really worked quite well on Vice City’s graphics and sound. The cars and bikes are exactly modeled like the 80’s vehicles. The buildings and pedestrians are similar, but realistic. Vice City appears completely different on a hot and sunny day compared to its night scenes. Developers did a great job on lens flaring and rendering. The soundtracks and voice acting are impressive. Players can hit the road and cause damage while listening to lots of 80’s singles. 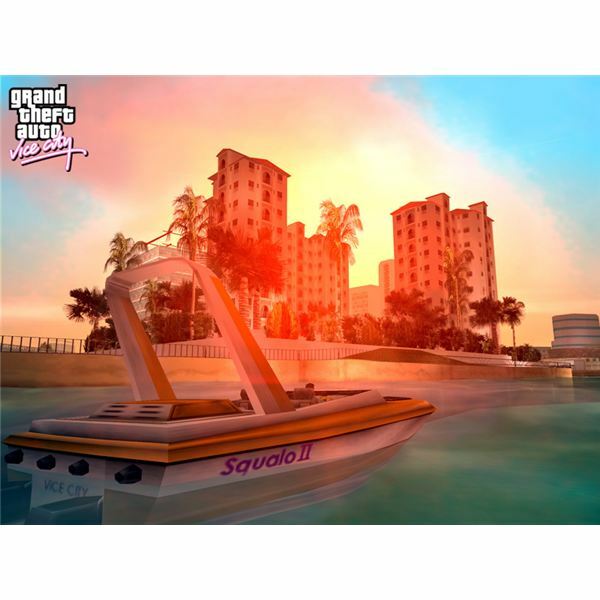 Grand Theft Auto: Vice City is certainly an epic crime saga set on the beautiful Miami-like city. Its varied gameplay, graphics and sound truly shows the time and effort dedicated in creating such game. It may be controversial because of its moods and intentions, but it certainly comes under a distinctive genre of gaming.